Near the Apple Cider Smugglers HQ, MAESTRO opened an inn so the smugglers and tired travellers could take a good sip of an apple cider or take a decent rest before challenging the waves again. As the newly founded hamlet was located within a few miles of the contested Isla de Victoria, there were a lot of soldiers patrolling in the area around the HQ and the Inn. Well, this was a fun build (even I had to tear apart one of my favourite MOC's that belonged to Stedor). Really cool inn! The flower roof technique looks great and is quite unique. Good Job! Oh! Those are flowers on the roof. I have never seen that before. The effect obviously works well because I didn't realize I was looking at flowers at first. This almost looks like it would fit in a Christmas village with the coloring. The design also looks great. My only question wold be where the daughter is. You mentioned her in the story but I didn't find her in the pictures which made me feel I was going crazy. Flowers for roofing work quite well! The color scheme also makes this build very nice. A little more scenery around the inn along with the minifigs would complete this build nicely. 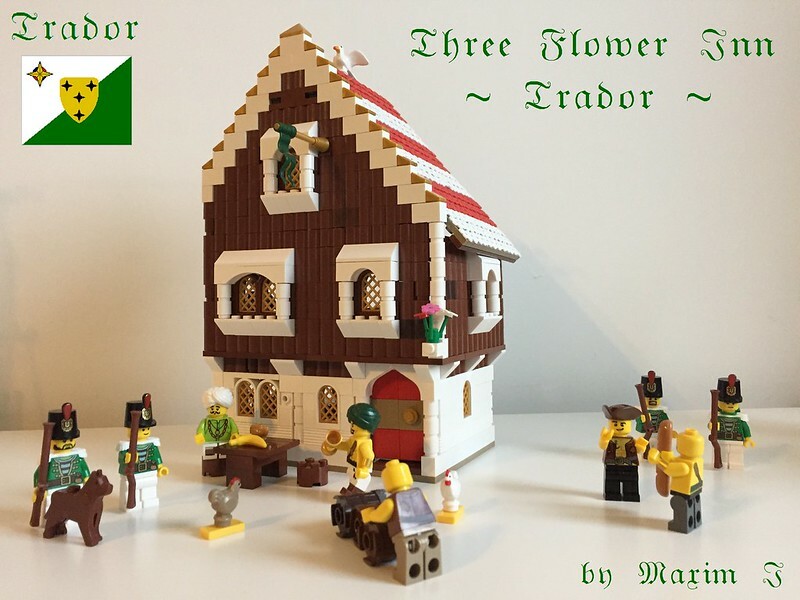 Wow, that flower roof really does look very neat here, Maxim, and though it and the brown and white color-scheme almost give it a gingerbread house look, that's not a bad thing at all! Maybe that has something to do with why the guests stay longer than planned as well! Looking forward to watching this settlement expand! Very cool inn, inside and out! As Garmadon said, the colors do make me think of a gingerbread house! And as other have mentioned, the flower-made roof is quite good. I only wish we had gotten a little bit of the streets of Trador (dirt streets, I would presume, as it is probably too early for cobblestones to have been laid) for those soldiers and patrons to move about on. Still, excellent build! Is it just me that noticed the door? I have not seen that technique before. Somehow this makes me think of both Alsace and Austrian ski resorts at the same time.